Innovative Glass has Australia's most innovative range of semi-framed and fully framed shower screens. 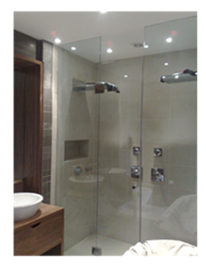 Innovative Glass has fully Frameless shower systems which offer a wide range of swinging or folding door models, side panels and doors with overlapping glass – glass joints, which keep water from spraying out without any additional seals and at the same time allow for adjustment over a wide range during installations. Slim fittings increase the effect of transparency. New Zealand Hardware; manufactured in solid brass with heavy duty stainless steel springs, pin and screws in a satin chrome, or polished chrome finish.